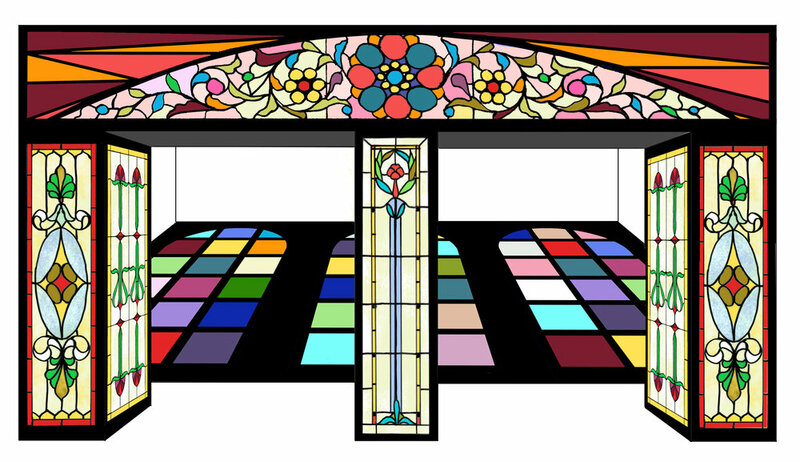 The City of Poughkeepsie is adorned with splendid stained glass windows throughout its remarkable architecture, including in public buildings, places of worship and historic homes. My mural design encompasses an array of imagery culled from a large sampling of windows I have visited, most of which go unseen (or unnoticed) by locals and visitors. After photographing and sketching in dozens of locations throughout the city limits, I created a design for each underpass that gives the illusion of complex illuminated windows shining out from the dark space. Windows serve multiple purposes: to create luminous interiors, to frame a view, and to be looked at or through. Presenting Poughkeepsie in the best light, focusing on its diversity of people, places and building eras, is a central component of the design. Late Gothic, Victorian, Craftsman and Modern styles are represented, while the imagery omits markers such as crosses and figures to avoid symbolism overtly rooted in any particular religion. The shapes are often a hybrid of many windows I encountered in my explorations. I frequently joined several windows from various locations into one image, combined parts of windows in several places together, and pulled out details of intricate imagery to become accent windows. 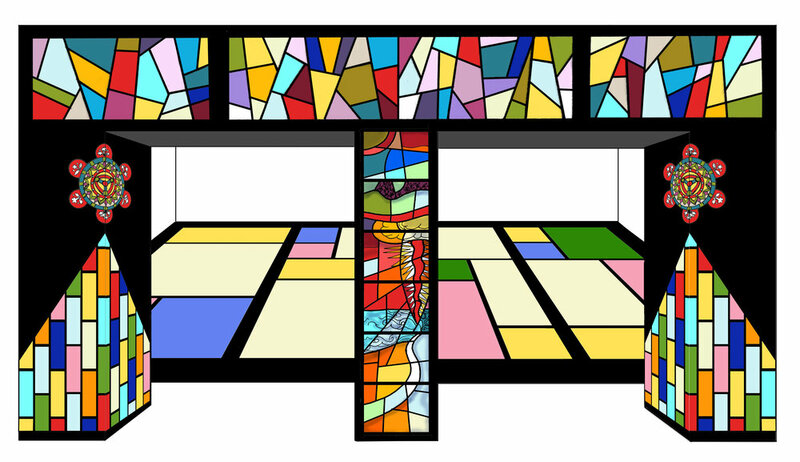 One example of this fusion is the back wall in “JWB Underpass Mural Study 3 of 4,” which depicts the shape of the train station windows with the polychrome window squares of a historic landmarked home juxtaposed overtop. All of the concrete surfaces of the underpasses will be painted including multiple sides of the columns, aprons and back walls. The north side of the street, closest to the train station, will contain the most intricate windows and the south side of the street will contain more of the modern window imagery. The angled back walls will contain be comprised of the most graphic silhouettes and function as a stage-like backdrop for the other imagery. The geometric forms will also allow for easier repainting in the future if needed. The windows also connect our city’s population as it changes over time, as different groups have inhabited these buildings over the years. For example, the circa 1833 Greek Revival style church at the corner of Vassar and Mill streets was originally a Presbyterian church (whose congregation bought the land from Matthew Vassar’s family), then a Congregational Church, then a Masonic Lodge, then a Synagogue. Since the 1950s it has been the Second Baptist Church and currently has a predominantly African American congregation. I came upon many similar situations with other historic structures throughout the city. The selection committee for the Poughkeepsie Gateway, an art intervention at the Route 9 underpass on Main Street, selected 5 finalist mural proposals from the following artists: Julia Whitney Barnes, Risa Tochigi aka Boogie, Peter Daverington, Layqa Nuna Yawar and Justus Roe. The Poughkeepsie Gateway is a commissioned mural project that is a partnership between Poughkeepsie Alliance, Arts Mid-Hudson and O+ Poughkeepsie.